A proper stereo image is acutely dependent on channel balance. An imbalance of only 1dB is enough to cause a noticeable lateral displacement of the soundstage, and channel balance tends to change a lot more than that when one listens from any position not absolutely symmetrical to the loudspeakers. When we move off center, three things happen simultaneously to unbalance the stereo image: first, because most speakers direct middle and high frequencies straight ahead, listening from off the axis of either speaker diminishes the energy through this range which reaches the listener from that speaker. Second, sound pressure diminishes as you move farther away from a loudspeaker, according to what is called the inverse-square law. That is, sound pressure diminishes according to the square of the distance from the source. Any shift of listening position to, say, the left of center causes an apparent increase in the SPL from the left speaker and a corresponding diminution of output from the right-channel one. Finally, our ears tend to localize sounds according to the direction from which they reach us first (the so-called precedence effect). 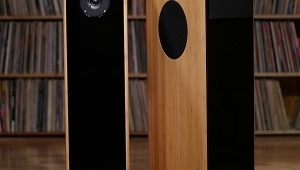 Moving closer to one speaker shortens the distance its sounds travel to us, and their earlier arrival (relative to those from the other speaker) causes their apparent direction to shift towards that speaker. All of these things work in concert when you listen from off-center, reinforcing the apparent image shift toward the closest of the two speakers. The amplitude phenomena involved here are best visualized with the help of loudspeaker polar patterns. These are circular graphs which show how a speaker's radiated signal varies in intensity according to its direction. The outermost circlethe perimeter of the graphrepresents the loudspeaker's maximum output; the smaller concentric circles represent decibels of attenuation, in 10dB steps. The loudspeaker is assumed to be at the center of the circle, and the front of the speaker enclosure (which is also, usually, the horizontal axis of its drivers) is considered to be the zero-degree direction. The perimeter of the graph is then marked off in degrees away from zero in both directions (CW and CCW), with its rear being (of course) 180° in both directions (fig.1). A polar pattern is plotted in an anechoic chamber by feeding a sinewave test signal through the speaker, placing a (nondirectional) microphone a specified distance from it on the axis of its drivers, then rotating the speaker on a turntable. Maximum output will usually be obtained on-axis; off-axis output readings are then plotted on the circular grid in terms of dB below that maximum versus angular displacement from on-axis. 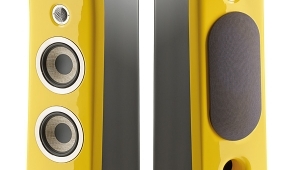 If the speaker is truly nondirectional, as were the original Ohm Walsh designs, there will be no signal attenuation at any point around the compass, so the speaker's polar pattern will be a circle. Any tendency toward beaming will produce an oval or tear-shaped pattern, as in fig.2. It is important to understand that a polar pattern does not define the limits of a speaker's sound-radiation field; it merely shows how much its output is attenuated as a function of radiating angle. If you listen from outside the plotted radiating area, you will still hear signal, but it will be at a reduced level. It is also important to note that the polar pattern for any loudspeaker will varyoften tremendouslyaccording to the frequency used for the plot. Generally, the higher the frequency, the narrower the beam, although the beam width at a given frequency will also depend to a great extent on the physical size of the radiating surface: the smaller, the wider. This too will affect the imaging capabilities of the speaker. 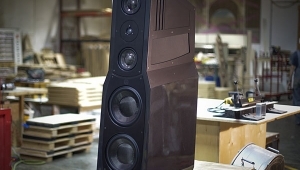 The tendency for most speakers to beam at middle and high frequencies is why "toeing" them inward, crosseyed fashion, usually helps to stabilize the soundstage. With the mid- and high-frequency beams converging at or a little in front of the listener, any head movement toward, say, the left of center will move the ears slightly out of the beam from the left-hand speaker and more into the beam from the right-hand speaker. The resulting change in apparent channel balance due to loudspeaker beaming will be opposite to the apparent change due to distance (and inverse-squaring), with the result that one will act to offset the other. If the amount of this toeing-in is sufficient to cause just the right amount of over-correction of amplitudes, it can also compensate for the precedence effect, increasing the width of the "sweet spot" from an inch or two to a few feetenough for a small group of people simultaneously to hear good stereo. Toeing-in is generally only a partial solution, though, because most speakers do not exhibit the ideal, smoothly curved off-axis dispersion patterns that theoretically they should. Instead, polar patterns usually exhibit many off-axis mini-beams, which appear as lobes on the pattern, as shown in fig.3. These lobes, whose magnitudes and sharpness vary according to frequency, introduce complex patterns of amplitude difference between the stereo signals, impairing imaging specificity and stability at all listening locations. (It is the presence of many such mini-beams which causes the so-called vertical-venetian-blind effect or VVB, footnote 1.) This is why the speaker orientation which produces the best possible imaging from a center seat usually produces the worst imaging from any other listening position. It is also why toeing-in may impair perceived imaging at the "sweet spot" as it improves imaging off-center. 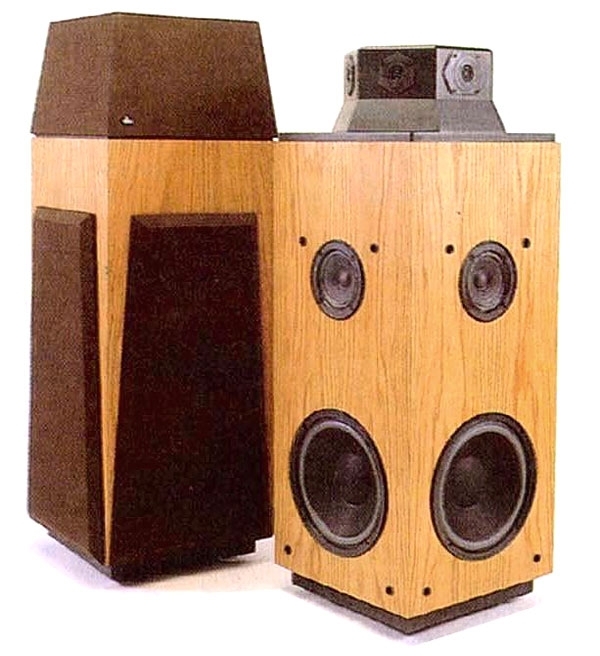 A complete and thorough discussion by then-Editor John Crabbe of how a loudspeaker's dispersion pattern may be optimized so that a pair produces a wide listening area where stable stereo imagery can be perceived, "Broadening the Stereo Seat," appeared in the June, July, and September 1979 issues of Hi-Fi News & Record Review. 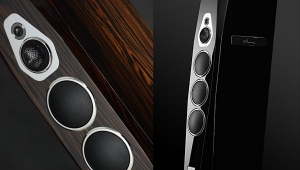 The Soundfield speaker is dbx's practical realization of an answer to this problem. 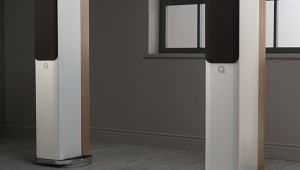 Each Soundfield 1-A speaker is essentially a square column with drivers aiming in all directions. 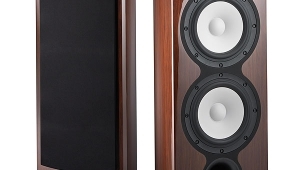 Each face of each speaker has a 10" woofer topped by a 6" midrange cone, while at the top of each speaker is a hexagonal "cupola" housing six 0.5" dome tweeters with their horizontal axes aimed at 60° intervals. 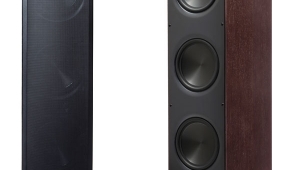 If all of these elements were driven by a conventional three-way crossover network, each speaker would radiate an almost perfectly omnidirectional (circular) pattern. But they aren't, and they don't. 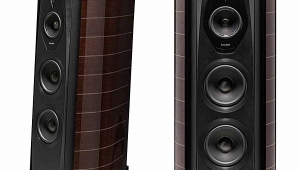 Instead, each speaker unit contains complex phase- and amplitude-shaping networks which shape the output energy so as to direct sounds more in one direction than the other. The polar response is slightly elliptical, and is displaced to one side of the speaker (fig.4). 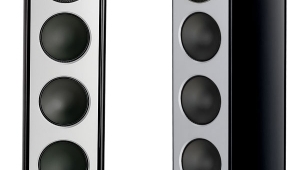 In terms of radiation, the Soundfield 1A has no "front" or "back" in the usual sense. 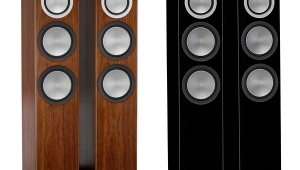 In use, the two speakers are oriented so that their offset polar patterns are directed toward one another. And since the patterns of each are symmetrical, there is no Left or Right speaker; they are not mirror-image pairs. 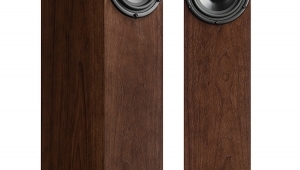 You can interchange the two, and as long as their areas of maximum output (marked on each speaker with a large white arrow) face each other, the speakers will work properly. The operating principle here should be obvious. 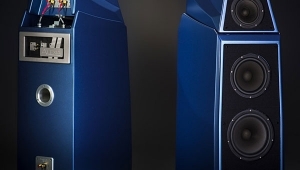 With the directivity patterns facing one another, a front-and-centered listener is partly off-axis of both speakers, in an area where the output from each speaker is about 3dB down from maximum. As he moves off-center to either side, he moves farther into the pattern of the more distant speaker and farther out of the pattern of the closer one, producing a level increase of about 2dB from the farther speaker and a decrease of about 1dB from the nearer one. The amplitude difference attempts to correct for precedence, thus offsetting the usual effects of this change in position. 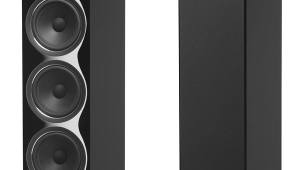 If the speakers are optimally placed (and assuming dbx did their design work properly), the result should be a completely uniform soundfield, with no apparent change in channel balance, from any listening location across the distance between the speakers. Footnote 1: The Vertical-Venetian-Blind effect describes a rapid back-and-forth hopping of the apparent sound source as the listener moves his head to one side or the other. It has been likened to listening through the pickets of a laterally moving fence, or through vertically oriented venetian-blind slats.